It always traditional for January to start on New Year’s Day and this year was no different and if it’s New Year’s Day then it must be the New Year’s Day handicap. 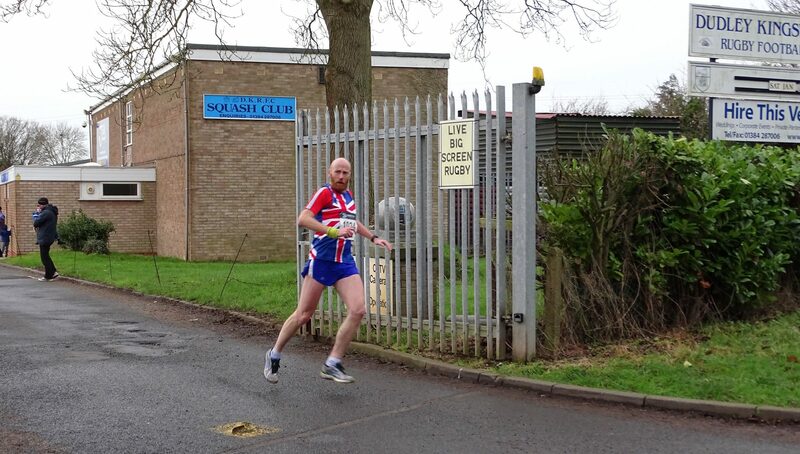 It was a relatively low key event this year, only managing to attract around 30 runners who were sent off at intervals over a 4.1 mile course with their starting positions based on their 10k times. Tom Holden of Tipton Harriers claimed the fastest male prize from the DK duo of Ben Foster and Matt Biggs with Tipton’s Lawrence Heathcock finishing with the 4th fastest time of the day but bagging the “closest the handicap prize”. DK’s Carol Fisher finished 3rd in the ladies race and Alison Whitehouse claimed the female prize for being closest to her handicap mark. Elsewhere Andy Sprague tried something a little more strenuous travelling to Church Stretton for Mercia Fell Runners organised Morning After Fell Race, an 8km race with 275 metres of climbing, finishing in 60th place in a time of 41.43. It may have been FA Cup 3rd Round weekend for footballers a week later but it was County Championships weekend for runners as a small group took part in their regional competitions. Those going down the residency route competed in the Staffordshire Championships at Sandwell Valley with Ben Foster finishing in 12thplace in 36.50 and awaiting confirmation that this will be enough to secure his first Staffs vest in the Inter Counties Championships in Birmingham in March. Matt Biggs finished in 31st in 40.09 claiming some notable scalps in the process, unfortunately the third runner of the trio, James Wright, was forced to pull out during the race due to injury. Elsewhere Dave Norman played the county of birth card to compete in the Shropshire Championships at Attingham Park near Shrewsbury. Over a near 7 mile course covering multiple laps of increasingly muddy parkland he was able to finish in 59th place in 46.53 despite freezing cold rain mid race making conditions particularly unpleasant. Ben Foster may have been bested by Tim Dalton of Severn AC in the Birmingham and District Cross Country League seven days later but the blue hoops were still able to extend their lead at the top of the table. 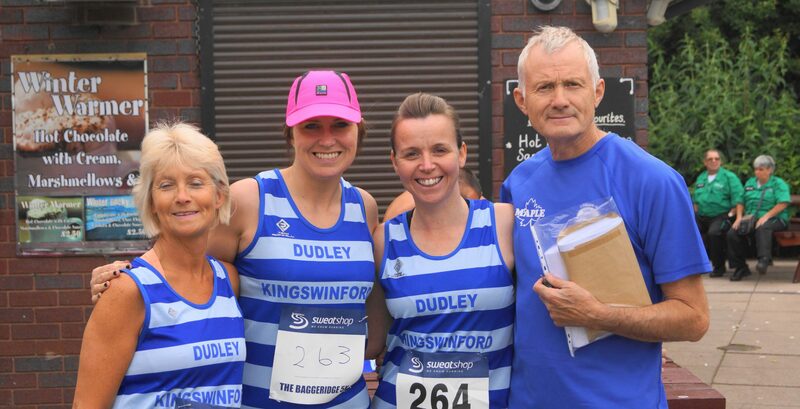 The weekend’s fixture was over a testing six miles of muddy twists and turns in Droitwich and again DK arrived with massive numbers, 20 athletes on the start line, to try to consolidate their lead at the top of Division 3. Although Ben Foster was unable to add to a previous win at the venue from his last visit he was still a comfortable 2nd place finishing in 37.55, Rob Meredith was 5th place in 38.38, Matt Biggs finished in 11th in 39.42, James Wright was 12th in 39.45, Simon Hughes was 29th in 42.21 and Richard Bate was 30th in 42.29 to bring home the A team. Again the B team were well placed with Rob Sannwald finishing in 33rd in 42.45, Dave Norman was 35th in 42.48, Stuart Perkins was 40th in 43.14, Daren Thompson was 45th in 43.27, Simon Blizzard was 54th in 44.12, Darran Bishop was 57th in 44.29. in addition Andy Sprague was 60th, Mark Homer 69th, Mark Judge 84th, Kieran Pitt 118th, Stephen Parr 119th, Sergej Lyubovnikov was 142nd, Graham Wildgoose was 149th and John Andrews 150th. With DK winning the fixture on the day by 40 points they remain top of the division with what appears to be a comfortable lead from Northbrook AC and Sparkhill Harriers. The B team are also top of the B team league and would in fact have placed 4th overall to demonstrate the strength in depth currently at the club. Whilst the men were in Worcestershire the women travelled further south to Gloucester for their fixture. Tracy Alderson was first home in 77th in 26.49 just getting the better of Helen Tromans who finished a single second and one place behind after missing a significant chunk of training through injury, Rebecca Warren was 134th in 28.55, Carol Fisher was 140th in 29.09, Lynn Sprague was 179th in 30.35, Karen Doy was 182nd in 31.02, Jacqui Elson- Whittaker was 184th in 31.04, Hannah McGuire finished in 202nd in 32.27, Sarah Cox was 204th in 32.33, Liz Comley, making her debut, was 223rd in 33.39, Sally McConville was 231st in 34.05, Sam Hemming was 234th in 34.13, Charlotte Tonks was 262nd in 36.16, Sarah Krivosic was 272nd in 37.47 and Lisa Newell was 274th in 37.55. Less than twenty four hours later there was another opportunity to run round a muddy field in the Midlands Masters Cross Country Championships in Wolverhampton. Only open to over 35’s this event attracts a small but competitive field with five athletes from DK lining up on their second start line of the weekend. It was worth the effort with the club claiming medals with James Wright winning an age group bronze over the 8k course and claiming a team silver with Matt Biggs, Dave Norman, Simon Hughes and Darran Bishop. After all the recent cross country action the following weekend was a quiet one with only three club members pinning a number to the vest and pulling on the blue hoops. Even then they had to travel some distance to do so. With not much on the local calendar those looking for competition travelled to the Coed y Brenin Forest deep in Snowdonia for the Winter Trail Wales. After an enforced break due to injury Helen Tromans was back on form and first back for the club in 123rdoverall and 6th in her age group on 1.58.51. Peter Krivosic claimed 436th place in 2.50.40 and Sarah Krivosic finished in 478th in 3.05.53. The final week of the month saw DK running around another muddy field in Loughborough and the event was the Midlands Cross Country Championships attracting clubs from all four points of the compass making it a particularly competitive event. Originally due to be held at Stafford Common waterlogging at the original venue meant a change of plan with Prestwold Hall in Leicestershire stepping in at almost the eleventh hour. The additional travelling distance put a number of runners off but DK were still able to field a strong team to race round the three lap, 12 kilometre course. Despite a very gluey surface churned up by previous age group races Ben Foster was first home for the blue hoops in 55th place in 43.07, Rob Meredith was not too far behind in 62nd in 43.20 however Matt Biggs was forced to pull out after two laps, the sticky conditions and uncertain surface aggravating a hamstring problem. This left Dave Norman to take third place for the club in 161st in 49.10, Daren Thompson finishing 4th counter in 166th in 49.35, Simon Blizzard was 178th in 49.54 and Darran Bishop was 6th counter for the club finishing in 199th in 50.59. Knocking on the door of the A team Mark Homer came home in 216th in 52.07, Kieran Pitt was 250th in 54.18, Paul Silk was 268th in 55.30 and Graham Wildgoose was 272nd in 55.52. With Notts AC, Tipton Harriers and Owls AC taking the medals DK came home a very respectable 13th of the 32 clubs, ahead the big hitters of Wolverhampton & Bilston, Birchfield Harriers and Halesowen AC.